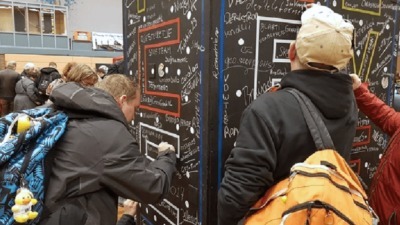 In the last 12 years, over four million geocachers have participated in one of dozens of geocaching-based Trackable promotions in partnership with adventurous brands around the globe. 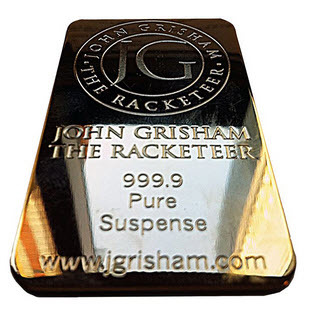 From John Grisham fans seeking gold ingot Geocoins to Jeep enthusiasts on the hunt for toy Jeeps, there are unique experiences for every type of geocacher. Trackable promotions give geocachers a unique opportunity to engage with some of their favorite brands on a digital and physical level while spending time enjoying their hobby. Partnerships have included free Trackable giveaways, pre-release sneak peeks, and photo contests with prizes ranging from a set of new tires for your vehicle (road trip anyone?) to all expense paid trips. 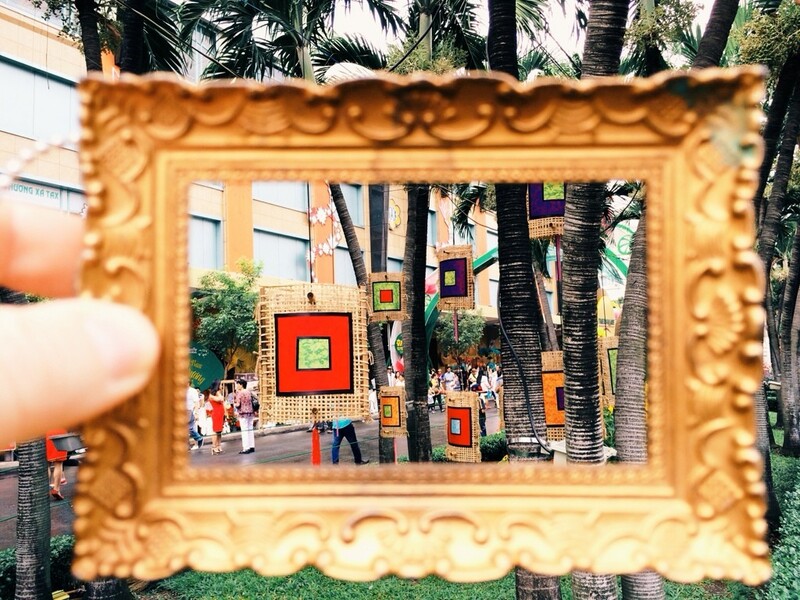 Each branded trackable builds a unique story as it travels. Trackables continue to generate engagement for years as geocachers discover and display these pieces of history at events, on social media, and online via their collection of unique digital icons (who wouldn’t want to collect a fancy little achievement for your profile page?) How many of these promotional Trackables have you spotted? This was one of the first branded Geocaching promotions and the first time digital icons were introduced on geocaching profile pages. Over 24,000 Trackables were attached to Matchbox Jeeps and released in different color batches from 2004-2007. 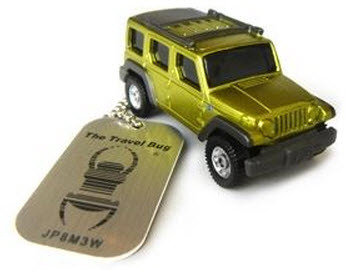 Jeep trackables have traveled over 16 million miles to date and have become a staple within the geocaching community. The first Yellow Jeep in the promotion was even inspired by the Yellow Jeep Fever, locationless cache, which was a life size jeep! Throughout the promotion Geocachers submitted photos and essays about the Trackables for a chance to win the top prize: a full size Jeep vehicle. Want to discover a jeep for yourself? 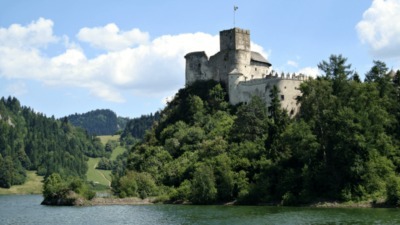 Follow their latest movements or stop by Geocaching HQ’s museum! 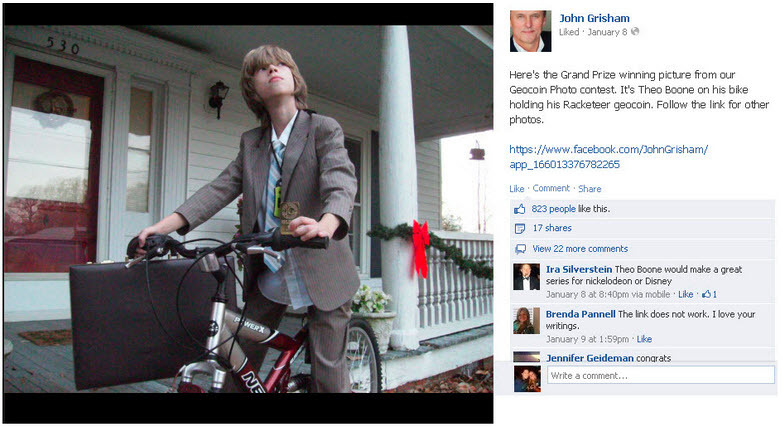 The winning picture was of a young boy who posed with the “Grisham Geocoin” as a character, Theodore Boon, from Grisham’s series of young adult novels. The story continues two years later: “Big score at Goodwill lol. Figured I had the trackable, might as well read the book. Both books for only $2. Might need to use for another library cache” – Jason Winder / animjason, Facebook, 12/2/2014. 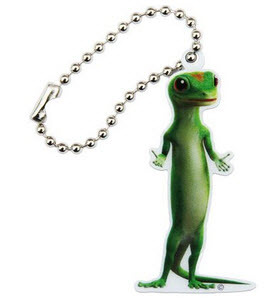 GEICO’s 2011 Geocaching promotion released 9,000 Trackable tags designed in the shape of the iconic gecko mascot into the hands of geocachers across the United States. The tags were sent on their way while spreading awareness for the “Find the Gecko” sweepstakes in which one Magellan Explorist GC GPS unit was given away to a lucky geocacher winner each week of the 20 week promotion! The gecko trackables were moved by geocachers over 73,000 times and remain one of the most popular trackables being discovered around the world, averaging 29 touchpoints a day years later. 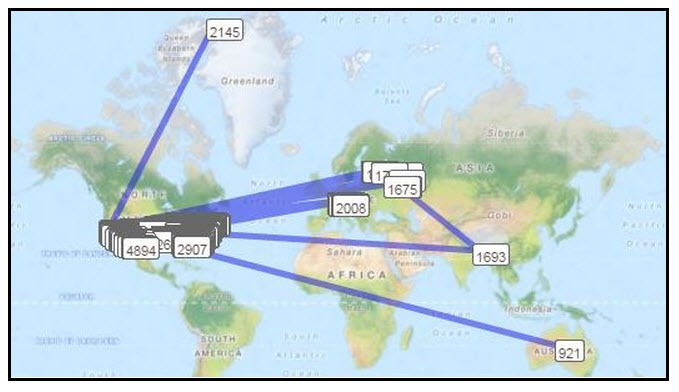 SHC’s Danger Ranger Geico Trackable has traveled the world collecting more miles traveled than any other Geico Trackable with a total of 326,315 miles (mapped above) since it was released into the game on June 11th, 2011. 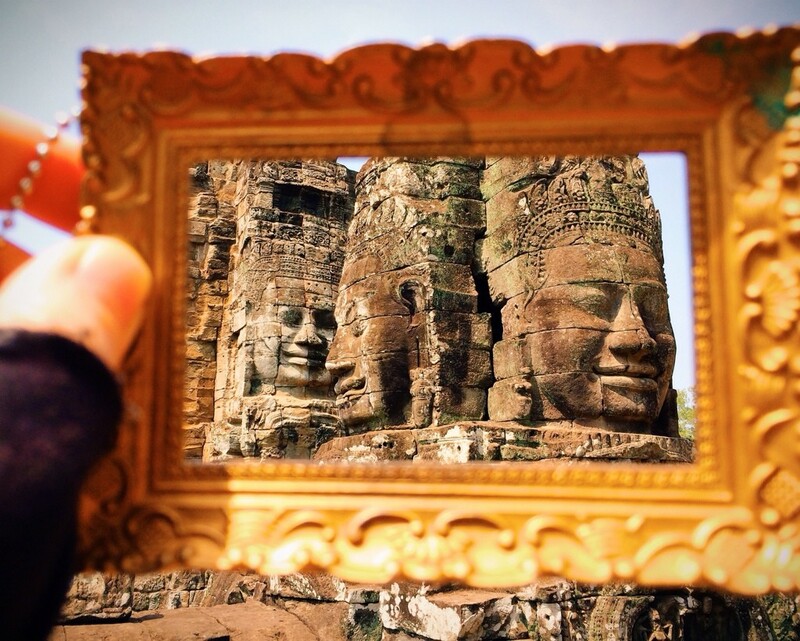 In 2014, Michelin celebrated their 125th Anniversary by launching a geocaching campaign to promote tire safety via a social media based photo contest. 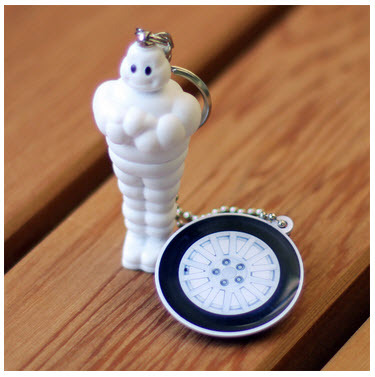 With 2,000 Trackable tags designed in the shape of a tire and attached to actual Michelin Man tire pressure gauges, geocachers were destined for success on the road. Geocachers across the United States tapped into their inner photography talent by submitting over 1,000 photos portraying a sense of adventure to the official photo contest by using the hashtag #MichelinQuest on Twitter, Instagram, or Facebook. The Michelin Trackables have traveled almost 1.3 million miles in just 4 months and have saved many tricycle tires from getting too low on air. Geocachers submitted 1000+ photos over 4 months to the #MichelinQuest contest by adding the hashtag #MichelinQuest on Twitter, Instagram, and Facebook. These are just a few of the many examples of promotional trackable history. You can locate these promotional trackable types by looking up their latest movements on each of their home pages. Keep an eye on the Geocaching Facebook page and join 3.9 million other people who have subscribed to the geocaching weekly newsletter to learn when new contests and new free trackable series are available. 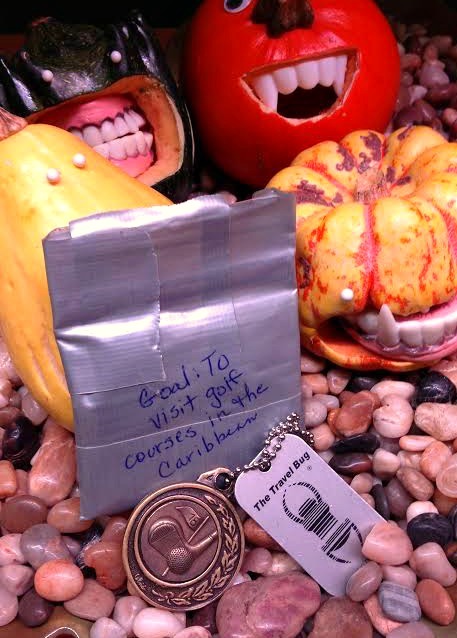 Geocaching trackables travel far and wide—hopping from geocache to geocache in the hands of geocachers. If we could hear the stories they had to tell, we’d have an endless supply of tales that include action, adventure, love and maybe even some sci-fi. We haven’t developed talking trackables just yet (soon? 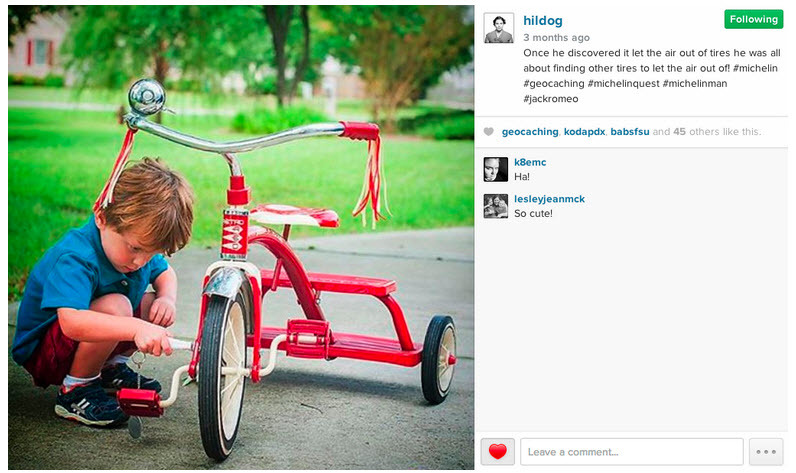 ), but they can still tell a story via the pictures you post on the trackable’s page. 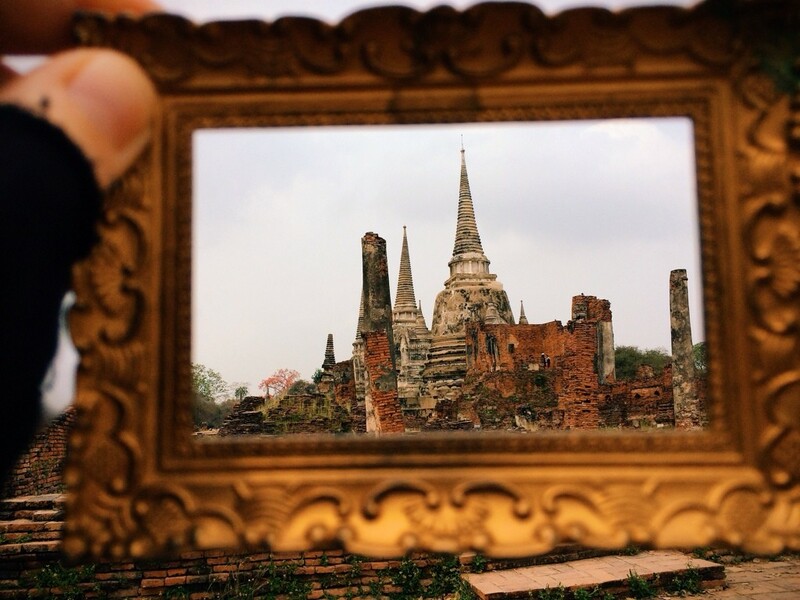 The next time you pick up a Travel Bug or Geocoin, make sure to add to the story and post a photo of its journey to the next geocache. You could help tell a story like Kelly Frazee (geocaching name: kelwin). 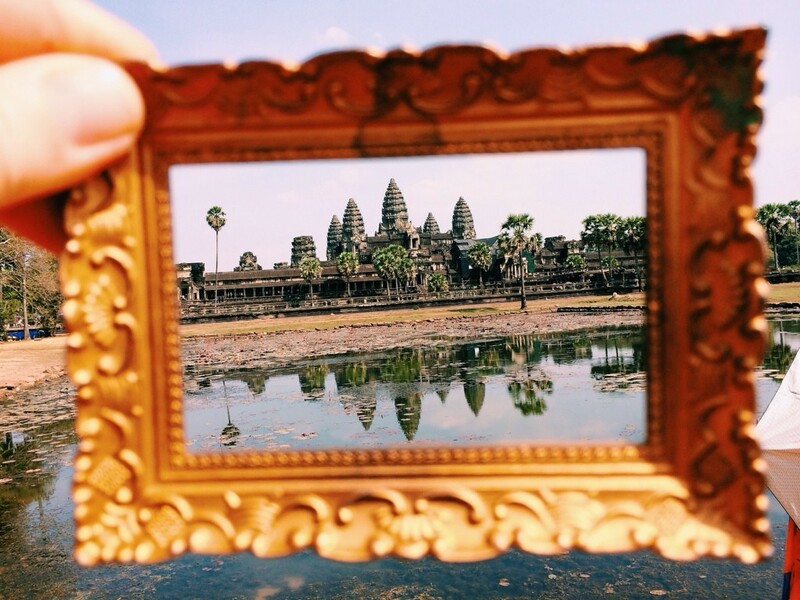 Have you taken any trackables to amazing locations? 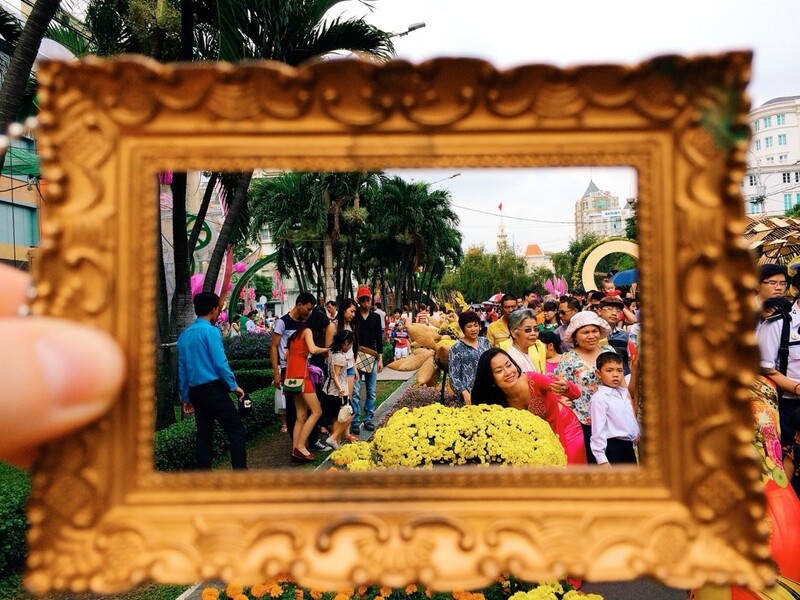 Tell the story and post the photos below. This holiday season one Geocaching gift will smile back at you as it travels the world, heck it might even wave. It’s the poseable and adorable trackable LEGO™ geocacher. 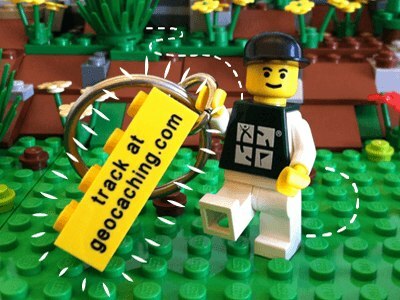 Each LEGO™ geocaching adventurer features the Geocaching logo and a unique tracking code. Launch the geocaching game piece on a mission to explore as it bounces from geocache to geocache and track the entire journey on Geocaching.com. It might even be tempted to take a trip the most favorited geocache in Germany, near LEGOLAND® Berlin. The trackable LEGO™ geocacher is one of dozens of holiday gift ideas available for U.S. orders through Shop Geocaching and orders outside through U.S. through our International Retailers. Happy Holidays from all of us at Geocaching HQ. 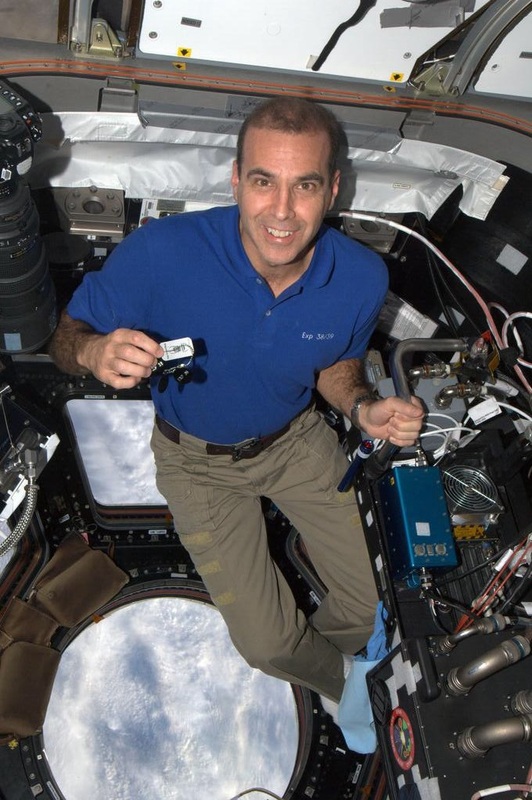 An American astronaut Rick Mastracchio (AstroRM) enters the Geocaching history books. He logged the First-to-Find (FTF) on one of the most exclusive geocaches in existence. 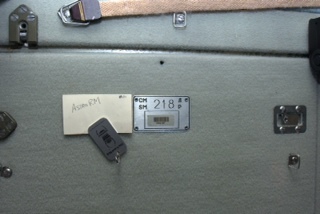 It’s a geocache hidden five years ago aboard the International Space Station. 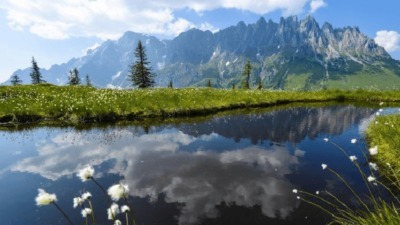 The geocache has orbited 260 miles above the Earth since geocaching pioneer and video game designer Richard Garriott created the geocache in 2008. Mastracchio thanked fellow Connecticut geocacher Robert Cizauskas (Cizzors) who first introduced the idea of geocaching to the astronaut. More than 26,000 geocachers at nearly 1,200 events around the world celebrated Geocaching in Space during Mastracchio’s launch into orbit. The Travel Bug is riding along with Mastracchio on an educational mission. He’ll use the Travel Bug as a tool to teach kids back on Earth about geography and science. The Travel Bug is scheduled to return to Earth when Mastracchio finishes his six-month mission aboard the International Space Station. 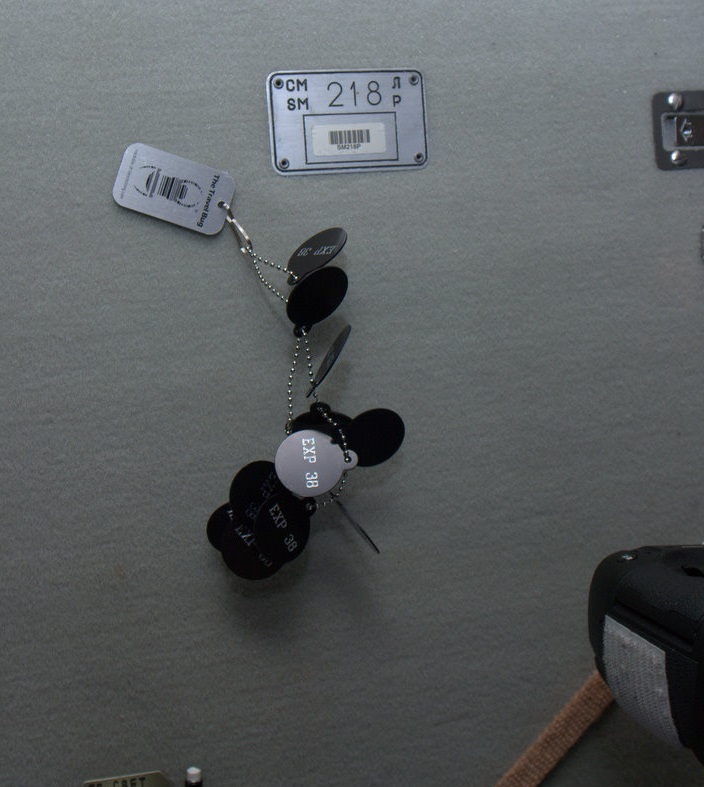 The previous Travel Bug Richard Garriott carried to the space station remained on-board the ISS for three years. It accumulated more than 350 million miles as it orbited the Earth. That Travel Bug returned to Earth by one of the last U.S. Shuttle missions to visit the International Space Station. Watch the video of Richard Garriott’s mission to space. Leave your best wishes for Rick Mastracchio below in comments.